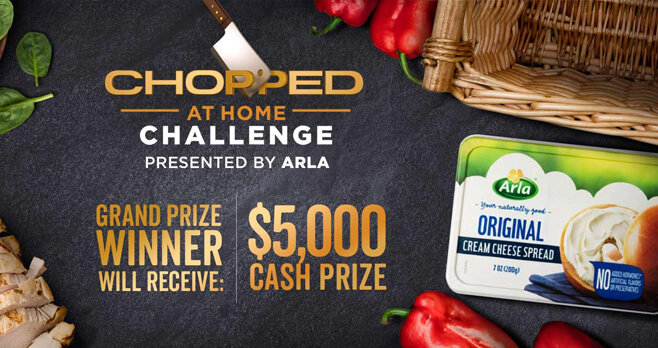 Ready to compete into the Chopped at Home Challenge presented by Arla? Go to foodnetwork.com/choppedchallenge and enter the Food Network Chopped at Home Challenge 2018 by sharing a Chopped-inspired dish for a chance to win a $5,000 cash prize. Who Can Enter? The Food Network Chopped at Home Challenge 2018 is open only to legal residents of the 50 United States and D.C., except Maryland and North Dakota, who are 21 years of age or older as of the Promotion start date. When To Enter? Sweepstakes begins at 9:00:00 a.m. ET on April 10, 2018 and ends at 4:59:59 p.m. ET on June 1, 2018. What Is The Sweepstakes Prize? The Grand Prize consists of $5,000 presented in the form of a check, and a gift basket including Arla products and helpful kitchen items. Who Are The Sweepstakes Winners? Beginning on or about June 25, 2018 you may obtain the name of the Grand Prize Winner by going to foodnetwork.com/sweepstakes.